After four decades in nursing, Marie, Home Therapies RN, CNN, MBA, of Clinic #7748 in North St. Petersburg, Fla., continues to accumulate letters and numbers after her name. The most recent are CRN5, which means Certified Registered Nurse Level 5. The Clinical Advancement Program (CAP) is designed to recruit, retain and reward nurses for developing clinical expertise in nephrology. CAP also aims to promote nursing excellence and to ensure quality patient care. “Marie is a shining star in our Home Therapies Program in the North Florida region,” said her supervisor Shannon, North Florida Regional Home Therapies Director of Operations. In 2008, Marie, who has been a dialysis nurse for 32 years, earned a dual master’s degree in nursing and business administration. She has also been a Certified Nephrology Nurse (CNN) since 1999, and has worked for Fresenius Medical Care North America and Renal Advantage for five years. As part of the CRN5 certification, Marie and a colleague developed a 12-month education PowerPoint for their Home Therapies patients. It was adopted by the North Florida Region in 2012 and integrated into a calendar with a brief synopsis of the monthly education requirements and then it was distributed to all the home patients for 2013. 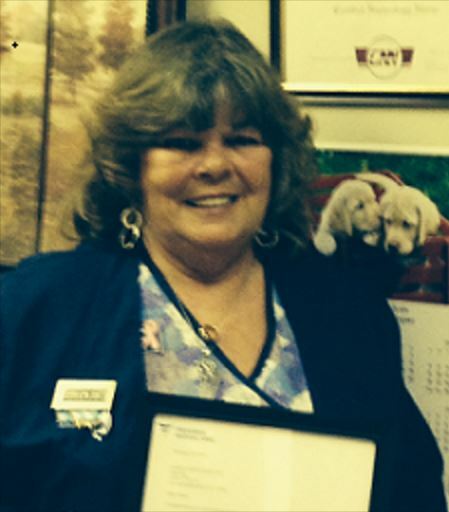 Marie said her patients provided the inspiration and drive that helped her to achieve the CRN5 designation. Marie also encourages her colleagues to continue their professional development advanced education. “Learn from your patients and achieve reachable goals through education,” she said.